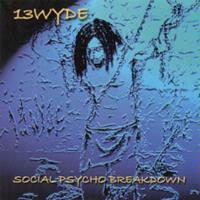 This is 13 Wyde's first album, Social-Psycho Breakdown. The band is made up of five people, including a lyricist. They're from Ontario, Canada, and have released this on their independent label. They describe their sound as a mix of Black Sabbath, Pink Floyd and mainstream rock. Some of their songs sound very much like classic rock, some very much like more mainstream music. There are some good tracks here, as well as some very skippable ones. The vocalist changes his voice as often as the other musicians change the style they're playing. It’s recommended for those who like both current mainstream rock and classic rock. For more information (including how to get the disc) check out the band's website. Social-Psycho Breakdown starts out well. "Sticks and Stones" is a heavy, enjoyable song. It begins with bass and drums, low and dark. The vocals come in after a few seconds, and match well with the music. The Black Sabbath influence is definitely heard here. The chorus is a little bit disappointing, but it still makes a good start to this album. The second track follows in the same tradition. This one, especially vocal-wise, sounds very much like something by the progressive metal band Hourglass. It starts out like a standard progressive metal song (minus the keyboards), and the singer Kevin Bardy comes in with a different sound than "Sticks & Stones,” but it's still very strong. This is the most progressive track on the CD. The band shifts the sound here dramatically. No more progressive metal or Black Sabbath sound. This feels very much like more modern music, with the same type of vocals you'd expect from Collective Soul or any one of the other late 90's popular rock bands. The music features a lot of guitar work, some of it a little bit fancier than a band like Collective Soul might do, but it's nothing spectacular. Overall, this is a bit of a disappointment after the first two songs. “River Deep” pulls a bit from the 80's rock scene, sounding rather like Corey Hart or Steve Perry. It’s an enjoyable song. The vocals are good, but the lyrics fall short, especially during the chorus. This is the softest number on the album. The mildest song so far, this definitely has the feel of modern rock, with the same breathy lyrics as most alternative rock acts, and a soft guitar sound. Keyboards make an entrance here and provide a more melodic and soft feel to the tune. A guitar solo towards the end adds to the emotion. This is a pretty song, sad and yearning. A hard modern rock song, the chorus makes this particular track difficult to listen to. It's hard to see any influence of classic or progressive rock here. This track starts out soft, and is reminiscent, again, of Collective Soul or other 90's rock bands. It's a pleasant song but there's no hint of classic or progressive rock, and it's not powerful enough to care much about. Sounding like mainstream hard rock in the beginning, this has the same vocal effect found in "I am the Dawn.” A minute into the piece, though, the classic rock/progressive metal sound is evident. This is the best example of being a true mix of classic rock and modern mainstream music. A fun guitar solo breaks this one up. Another Collective Soul-type song, this track has a touch of country in it. The lyrics get quite repetitive. A highlight occurs towards the end, when the lyrics stop and several voices sing at the same time, creating a nice chorus sound. Collective Soul again, this is dark with lots of bass. The bass goes crazy towards the middle, and the song gets a little more progressive and heavy. Kevin Bardy again sounds like Cody Walker, the singer for Hourglass. It’s a good cut, in the same vein, but not quite as enjoyable, as the first two tracks. The conclusion to this album starts out with a nice guitar piece. More mainstream rock than classic, with the same breathy lyrics, this is a harder song, and a good ending.